A housing development focussed on taking advantage of a dramatic site. 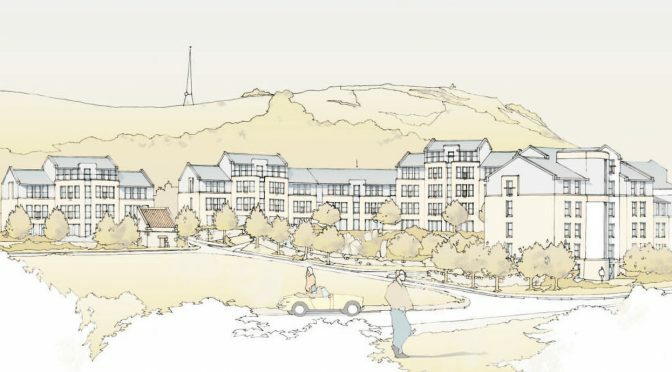 This scheme proposed 77 new residential 2-3 bedroom apartments. The accommodation comprises two distinctive crescents with a central pavilion. All the flats are positioned to exploit and enjoy the warm south westerly aspect. The centre piece, a new formal garden, sits upon the rocky volcanic plug around which the new roads and buildings are formally placed. The open south and west approach, together with the dramatic change in levels, allows the optimum environmental positioning for all the residential units. The crescents define and enclose the new central community space. Each crescent follows the curvature of the central garden space, containing and controlling the parking and service access.